Nashville is the capital of the U.S. state of Tennessee and the county seat of Davidson County. It is located on the Cumberland River in the north-central part of the state. The city is a center for the health care, music, publishing, banking and transportation industries, and is home to a large number of colleges and universities. Nashville is home to the Tennessee Supreme Court's courthouse for Middle Tennessee. The city's nicknames are "Music City" and "The Athens of the South." 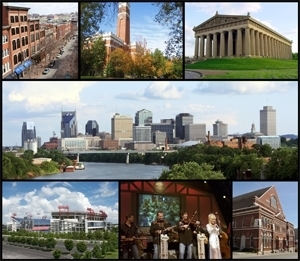 Nashville has a consolidated city–county government which includes six smaller municipalities in a two-tier system. Jan 27.9 F° 37.5 F° 47.0 F° 3.8 "
Feb 31.9 F° 42.0 F° 52.0 F° 4.1 "
Mar 38.9 F° 50.0 F° 61.0 F° 4.1 "
Apr 47.9 F° 59.5 F° 71.0 F° 4.0 "
May 56.9 F° 67.5 F° 78.0 F° 5.5 "
Jun 64.9 F° 75.5 F° 86.0 F° 4.1 "
Jul 69.9 F° 79.5 F° 89.0 F° 3.7 "
Aug 67.9 F° 78.5 F° 89.0 F° 3.2 "
Sep 60.9 F° 71.5 F° 82.0 F° 3.4 "
Oct 48.9 F° 60.5 F° 72.0 F° 3.1 "
Nov 38.9 F° 49.5 F° 60.0 F° 4.3 "
Dec 30.9 F° 40.5 F° 50.0 F° 4.3 "
Spring temperatures are cool with averages in the upper 50s and highs in the upper 60s. Nights are cold with lows in the upper 40s. Summer temperatures are warm with averages in the upper 70s and highs in the upper 80s. Nights are mild with lows in the upper 60s. Fall temperatures are cool with averages in the low 60s and highs in the low 70s. Nights are cold with lows in the upper 40s. Winter temperatures are cold with averages in the upper 30s and highs in the upper 40s. Nights are cold with lows in the low 30s.